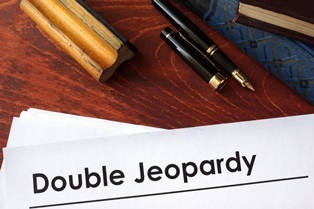 How Does Double Jeopardy Protect You If You Have Been Charged With a Crime? When you are charged with a crime, you may feel like you have no rights under the law. However, this is far from true. Under the United States Constitution, you have many protections when you face criminal charges. For example, you have a right to be given your Miranda warnings when you are taken into custody. Another important right you have is the protection against double jeopardy. Criminal cases. Double jeopardy only applies in criminal cases. It does not apply in civil or administrative proceedings—even if a defendant is found not guilty by a jury. Attachment of jeopardy. Under the Fifth Amendment, a person must be “placed in jeopardy” for the double jeopardy protections to apply. It does not apply just because a person was arrested. The criminal case must go farther along in the proceedings, and double jeopardy usually only applies once the jury is sworn in or the first witness takes his oath during a trial in front of the judge. Same offense. The double jeopardy rule only protects against multiple prosecutions for the same offense. However, this does not protect against multiple prosecution for multiple crimes. For example, if a person is charged with a more serious drug crime and is found not guilty at trial, the prosecution could charge him with a lesser offense, such as possession of an illegal drug. Termination of jeopardy. In order for the prosecutor to prosecute the defendant again, jeopardy must be terminated. This means that the case must conclude in some fashion. For example, an acquittal is a conclusion of the case against a person. Same sovereign. The sovereign refers to the governmental entity that is prosecuting the accused—state or federal government. This means that if a state prosecutor loses a criminal case at trial, he cannot prosecute the person for the same crime twice. However, if the state crime the person is charged with committing is also a federal crime, he could also face federal prosecution for the same crime. Multiple punishment. Prosecutors often charge defendants with more than one crime for the same criminal activities. If the person is convicted of the crimes, double jeopardy protects him from punishment for more than the most serious offense. Mistrial. If a criminal case ends in a mistrial because the jury is a hung jury that could not reach a verdict, the prosecutor is permitted to retry a person for the same crime. This is because the case ended due to a technicality rather than a decision on the charges. Jury misconduct. If there is some misconduct by one of the jurors, the trial may be terminated, and the prosecutor could be allowed to prosecute the individual again. Appeal. When a defendant is found guilty by a judge or jury and wins an appeal that overturns the conviction, the prosecutor can retry him. If you are being charged with a crime, your rights against double jeopardy and your other constitutional protections are very important to ensuring that you receive fair treatment. Violations could severely weaken the case against you or result in the charges against you being dismissed. However, you need an experienced criminal defense attorney to be certain that your constitutional rights are not being violated. To learn more about building a strong defense to the charges you face, fill out our online form to schedule your free consultation.